This volume includes over 30 chapters, written by experts from around the world. 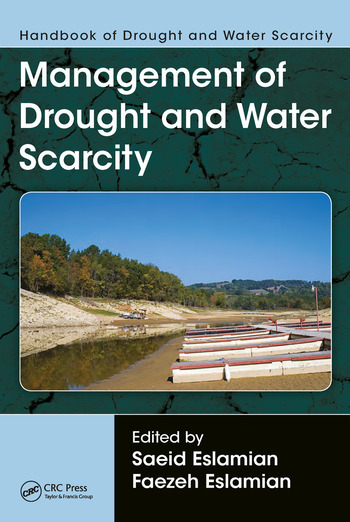 It examines numerous management strategies for dealing with drought and scarcity. These strategies include management approaches for different regions, such as coastal, urban, rural, and agricultural areas. It offers multiple strategies for monitoring, assessing, and forcasting drought through the use of remote sensing and GIS tools. It also presents drought mitigation management strategies, such as groundwater management, rainwater harvesting, conservations practices, and more. Dr. Saeid Eslamian is professor of Hydrology at Isfahan University of Technology, where he heads the Hydrology Research Group in the Department of Water Engineering. His research focuses mainly on statistical and environmental hydrology and climate change. In particular, he is working on modeling and prediction of natural hazards including flood, drought, storms, wind, groundwater drawdown, and pollution for arid and semi-arid zones, particularly in urban areas. He is also a Visiting Professor at Princeton University, and University of ETH Zurich, Switzerland. He has contributed to more than 300 publications in books, research journals, and technical reports or papers in conferences. He is the Founder and Editor-in-Chief of both the International Journal of Hydrology Science and Technology and the Journal of Flood Engineering. He received ASCE and EWRI awards in 2009 and 2010 for his research. Faezeh A. Eslamian is a PhD candidate of bioresource engineering and research assistant at McGill University, Montreal, Quebec, Canada. She is currently working on the fate and transport of phosphorus through subsurface drained farmlands. Dr. Eslamian completed her bachelor’s and master’s degrees in civil and environmental engineering from Isfahan University of Technology, Iran, where she evaluated natural and low-cost absorbents for the removal of pollutants such as textile dyes and heavy metals. Furthermore, she has conducted research on the worldwide water quality standards, wastewater reuse, and drought guidelines. "The effect of drought on agricultural productivity is widely recognized, but the social, political, and psychological effects of drought may be just as important, especially in a world that is moving towards greater urbanization. 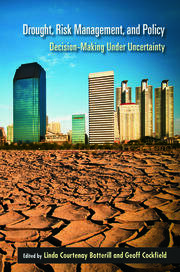 The papers in this book discuss the broader aspects of drought, with a view towards the future in an uncertain world." "The three-volume Handbook of Drought and Water Scarcity, edited by Saeid Eslamian, provides a unique synthesis of the recent state of knowledge, which has been fundamental for the development strategies and methodology of achieving the sustainable future we want." 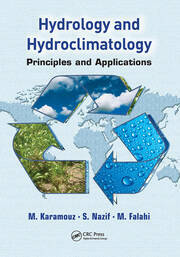 "This handbook provides a welcome addition to the literature on drought and water scarcity. Each of the 102 chapters in this three-volume handbook addresses a different issue of water resource management during periods of drought and water scarcity. Hence, a water resource manager should be able to find discussion relevant to resolution of their resource management problem. 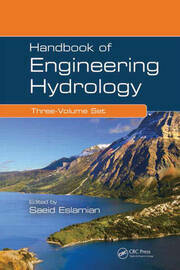 My congratulations on the production of a handbook that is a most welcome addition to the literature on this topic." "The Handbook of Drought and Water Scarcity includes a wide range of topics that will be an essential addition to professionals regarding the underlying concepts and techniques behind drought occurrence, its characterization, impacts, and consequences, and planning and management aspects. A valuable handbook for libraries worldwide." "This three volume set is a comprehensive treatment on this complex and important subject. It presents the definition of drought and its indices used for various sectors, the effects of a changing climate and ocean oscillations on drought, advanced methods for forecasting its progression, modeling its impacts on environmental, economic, agricultural, and social conditions, and mitigation methods and strategies, including technology, law, policy, and education." "This three volume set presents the most current developments in the theoretical and practical aspects of forecasting and monitoring droughts, assessing their consequences in many areas and developing optimal management strategies to lower or even avoid their negative effects in all areas of the environment, economy and our life."